Question: What was the best thing about the scheme? Answer: “The scheme opens politics to ordinary people who would never otherwise come close to it. ” Opening Doors feedback form, 2007. That was just one response. Altogether, feedback was so positive we are planning to run a second phase of the Opening Doors shadow scheme starting in May this year and we would love to hear what you want to learn about politics. One of the Opening Doors activities: a visit to the Scottish Parliament with Malcolm Chisholm MP. Opening Doors is for people living in the constituency of Edinburgh North and Leith and is open to anyone interested in politics. Perhaps you are even thinking of becoming actively involved in politics but don’t know where to start? Opening Doors gives you a chance to meet local politicians and ‘shadow’ them at work. The idea is to give shadows the chance to learn about the work of members of parliament and city and community councils at first hand. In the first scheme, which ran from October 2006 to January 2007, six people (five were women) took part. 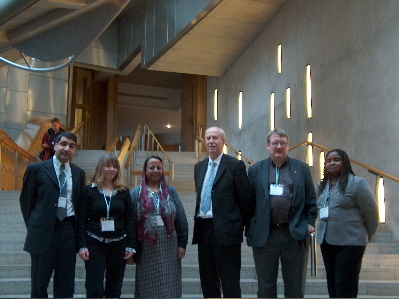 Representing African, Asian and Polish communities in the Leith area, each person shadowed a different politician – observing the work of Malcolm Chisholm MSP (at that time Minister for Communities) in the Scottish Parliament, following Mark Lazarowicz, MP, to Westminster, as well as getting an inside view of the responsibilities of city councillors in Edinburgh. This year you will again get the chance to meet and shadow Malcolm Chisholm (now Shadow Minister for Culture) at Holyrood and Mark Lazarowicz in Westminster but we are widening the scheme to include mentors from education and trade unions. As well as educational visits to the Scottish Parliament and City of Edinburgh Council, we also hope to run a workshop on the budget (investigating how politicians decide how to raise and spend the money!). For Leith Open Space perhaps the best part of the first shadow scheme was getting to know a great group of people we might not otherwise have met. Opening Doors is about politics but, much more importantly, it is about people. Delighted to add that we have just heard Councillor Gordon Munro is happy to take part in Opening Doors again as a mentor for the shadow scheme. Gordon is Labour representative for Leith Ward and also chairs the cross-party Neighbourhood Partnership Board for Leith offering a very interesting opportunity to anyone shadowing him at work. In the coming month LeithOpenSpace blog will take a closer look at what Neighbourhood Partnership means for local communities.